Murphy is a 16 & ½ inch, mahogany brindle dog, of fantastic athletic proportions. 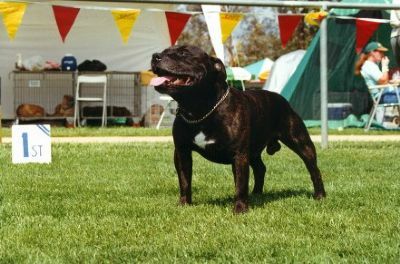 He gained his title in just over 12 months of being shown, at the age of 2 & ½., with wins including Best in Group, Runner Up Best in Group, and multi class in group. He has only sired one litter to date, and from this 2 Australian Champions were produced. Shortly after he gained his show title, he also received his Companion Dog title, and was awarded the Dumbar medal. Only the 2nd Stafford in the ACT to receive this award. Murphy was and is a great crowd pleaser and loves to show off given half a chance. A big clown when it comes to fly ball and he is a dog that doesn't believe in giving up his toy. Instead he will run along the outer circle of the ring with ball in mouth talking to who ever will listen! Usually getting a huge crowd applause. Having the patience of an Angel when it comes to looking after the little ones, he is the best puppy sitter ever!!! !